Cougar basketballers, seated from left, Charles Mells, Phadarius Taylor and David Atkins, have each signed to play basketball at the university level. 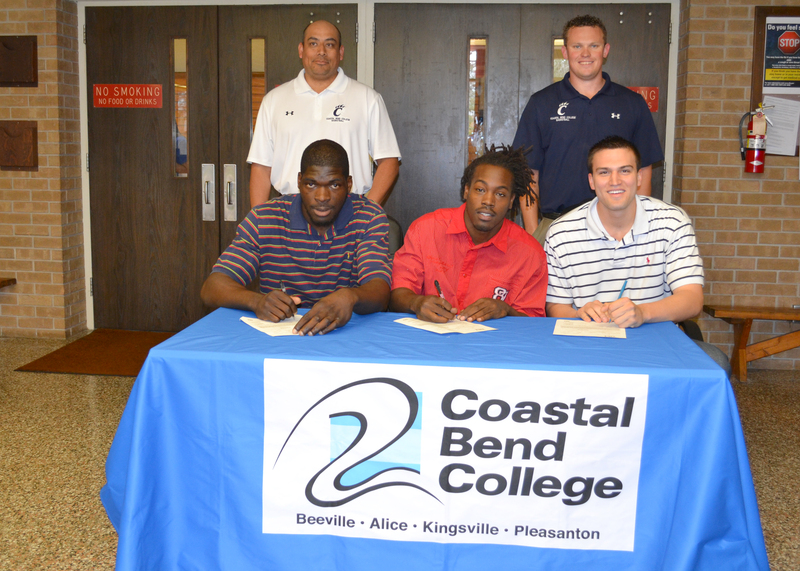 CBC Basketball Coach Larry Mendez, standing left, and Assistant Basketball Coach Colt Walker helped the athletes make that dream a reality. Three Coastal Bend College Cougar basketball players recently committed themselves to play for universities across the country. Charles Mells, a 6’11” Center from Miami, Fla. earned a full scholarship to Arkansas Tech University in Russellville, Ark. Mells, a graduate of Choice Learning Academy in Miami, is the son of Juanita Mells. His siblings are Erica, Latoya, Christopher, Lashonda, Shantericka, Stephanie and Bernard. Phadarius Taylor, a 6’2” Shooting Guard from Jacksonville, Fla. will go on to the University of Texas of the Permian Basin in Odessa. Taylor is a graduate of Samuel W. Wolfson Senior High School in Jacksonville, Fla. He is the son of Bridgette Johnson and has two siblings: Michael and La’Tara. Taylor will graduate with an Associate of Science Degree from Coastal Bend College on May 11. David Atkinson, a 6’7.5” McAllen native, played Small Forward for the Cougars. He is a graduate of McAllen High School and a 2010 Texas Scholar. He is the son of David Atkinson and Lahoma Petterson. Atkinson’s siblings are Tiff any, Austin and Alexander.